Mask has been used by man for protection, subterfuge, performance and entertainment for the last few millennia. It is an item that exists in many cultures of the world, each with its own identity and function. As an instance, in Malaysia, the Orang Asli Mah Meri tribe from Carey Island, Selangor, is well-known for its mask art. 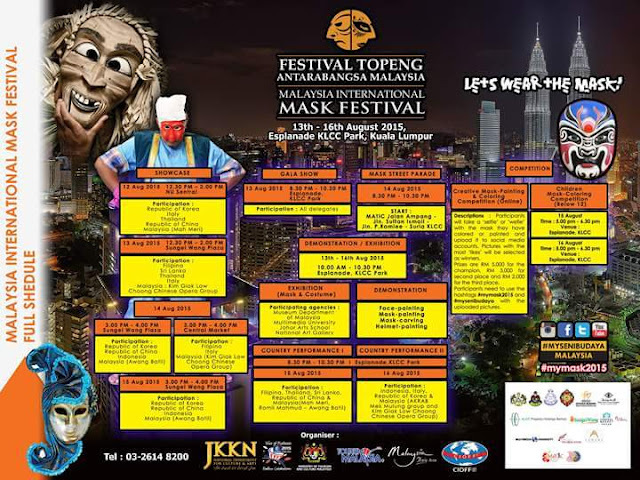 Thus, Ministry of Tourism and Culture (Motac) via the National Department for Culture and Arts (JKKN) will be organising the Malaysia International Mask Festival (MIMAF) 2015 from August 13-16 at Esplanade, Kuala Lumpur City Centre (KLCC) Park. This programme is going to be held for the first time in Malaysia as a signature event that is deemed able to attract tourists from all over the world to come to Malaysia. This festival also aims to instill understanding on the local and international community socioculture in relation with the mask culture by featuring the uniqueness of masks according to their motif and creation. It also exposes the characteristics, universality and variations of shape and design of mask in accordance with its function and role. Therefore, KLCC as a landmark of Malaysia has been selected as the location for this event, as it is a base for Malaysia’s most iconic shopping mall, hosting a series of prominent and unique international brands. Its location in the centre of the city makes it a popular tourism destination, ideal for a large scale prestigious international event such as MIMAF. MIMAF consists of five main components: performance, exhibition, demonstration, competition and parade. The performance component consists of gala, country and pocket showcases. Exhibition will feature mask and costume, demonstration will emphasise on mask-painting and carving, along with face and helmet-painting. 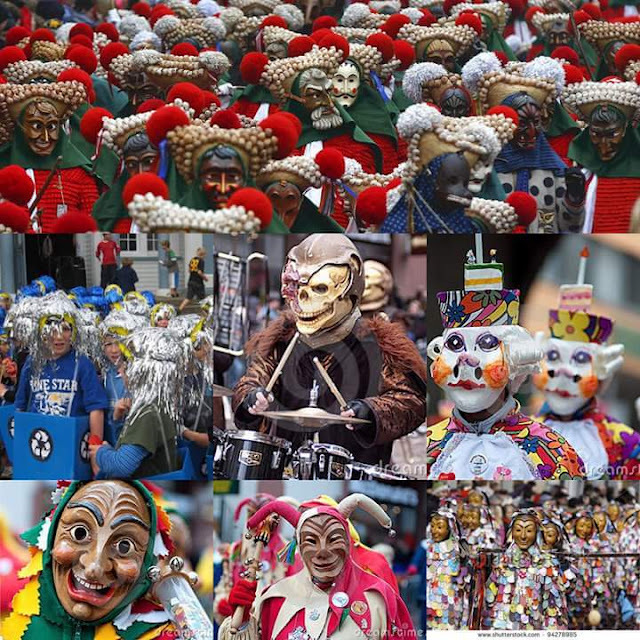 The competion aspect of MIMAF will highlight mask-painting and coloring, while the parade will spotlight the use of masks and costume—accompanied by grandiose music. The main showcase will feature performances from all participating countries, while the showcases will be held in various tourist-attractive places such as the Central Market, Sungei Wang Plaza and Nu Sentral. A one-kilometre mask parade will be held in the tourist-friendly roads such as Jalan Ampang (in front of MaTiC), Jalan Sultan Ismail, Jalan P.Ramlee and Suria KLCC. Full schedule of activities under MIMAF is attached in the appendix section of this document. JKKN is an agency under Motac that organises culture and arts activities in Malaysia. MIMAF is expected to achieve its goal in promoting Malaysia as an international culture-tourism destination through the highlight of its strong mask culture amongst the local and international community. Members of the public can browse MIMAF official Facebook fanpage, Malaysia International Mask Festival for many interesting and up-to-date information on MIMAF. 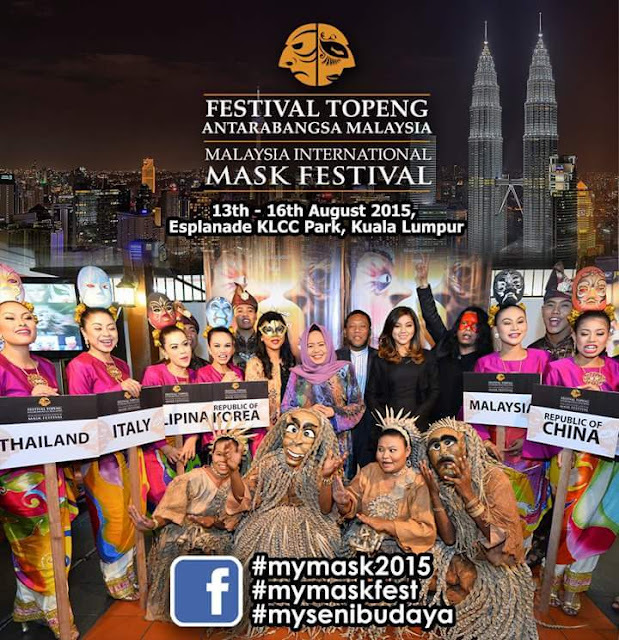 Out visitors can also upload ‘selfie’ and ‘wefie’ pictures with the hashtag #mymask2015 or #mysenibudaya to social media accounts during and after festival.